Commercial properties might not need fancy flooring but it’s important to keep your customers and your staff in mind for their comfort and ease of work. As a commercial property owner it’s also critical that your flooring look professional. Industrial epoxy can provide the look you are seeking with the affordable price tag and minimal upkeep. Port St Lucie Epoxy Pros offers clients a wide range of industrial epoxy colors and styles to select. Our industrial epoxy flooring is top rated and offers the durability and easy maintenance you want that can improve your concrete floors and turn them into the appealing flooring you need while hiding all the imperfection that were once visible. Industrial epoxy can change the way your commercial flooring looks and be an impressive part of your buildings features. It not only improves the way your floors look, it also requires far less tedious cleaning because it’s easy maintenance. Not only is the industrial epoxy flooring that we install smooth, it also has the ability to be easily cleaned. There is no waxing needed and it does not produce dust powder the way so much concrete slap flooring creates. Industrial epoxy flooring is also non porous, which means that when you have spills they are easily cleaned and returned to the shiny sparkling surface your had. 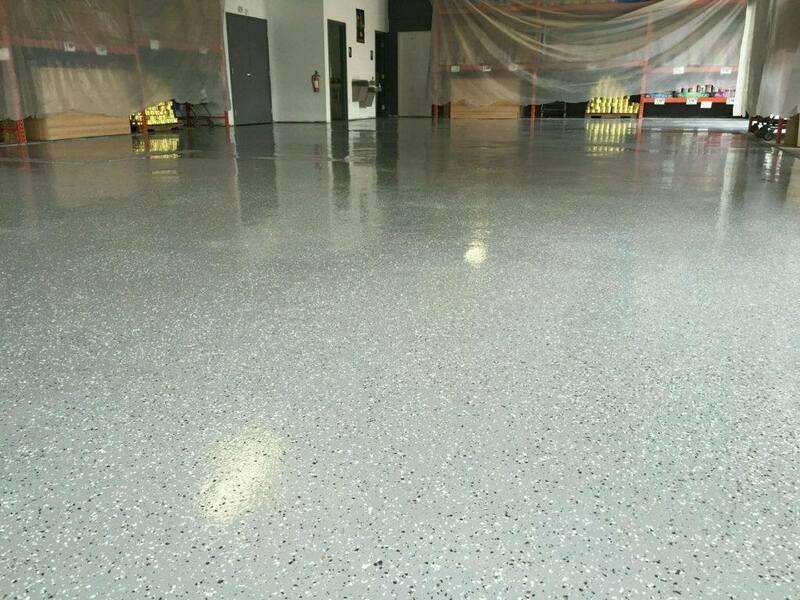 Like epoxy for your garage floors, it is a durable material and if you have a commercial property you probably have a great deal of heavy foot traffic and maybe even some equipment that runs across your warehouse flooring. Industrial epoxy is able to withstand equipment like forklifts, lorries and other vehicles without showing wear and tear. It has a long lifespan that so that you’re not shelling out resources for floor repairs because it won’t chip or fissure from the tough job it has to do as a commercial floor. This means you can save your resources for other commercial property improvements. As a commercial property owner you have a great responsibility to provide safe conditions for your staff and your customers. Industrial epoxy flooring can provide the increased safety you need because it is slip resistant and is not affected by extreme temperatures like those of fire. This means your staff and your customers have a layer of protection and you have the peace of mind you need as a commercial property owner who is responsible for more than just earning money. These are issues that can greatly affect your bottom like and Port St Lucie Epoxy Pros has the experience and skill you need to install your industrial epoxy flooring. Our industrial epoxy flooring has increased popularity throughout the region as more people begin to realize that their commercial property can benefit from flooring that is more durable that concrete and offers the safety needed for consumers and staff alike. We have been in the industrial epoxy flooring industry for decades, and with each new technology, we ensure that clients benefit from those state of the art advancements.